1) Ethan Hawk rushed past the Starbucks on Court and Dean once on a hot summer day and all of the middle-aged yoga moms inside the coffee shop freaked and were fanning themselves. 2) Paul Dano regularly frequented my Court Street deli at the same odd hours as I did. He’s very cool. 3) Paul’s girlfriend, Zoe, occasionally got coffee at the other Starbucks in the hood on Smith. Like Paul, she seems cool. 4) Michael Shannon often goes running in the neighborhood when he’s in town. He is both handsome and imposing to encounter in person. Basically, imagine seeing General Zod out for a jog. 5) Once, Robin Williams was shooting The Angriest Man in Brooklyn and I didn’t realize when I went into Pacific Green to buy yogurt that he was waiting in there for his cue. It makes me sad to even recall that morning, but we had a little moment where we exchanged glances because I was (naturally) surprised and he made me feel like I was in on a terrific secret without even saying a word. What a huge loss to the world that he’s no longer here. 6) Keri Russell, too many times to list. Sometimes you might refer to a woman as “pretty” or “beautiful” and you might definitely be using the most accurate word, but neither of those words do Keri Russell justice. She is gorgeous beyond description. 7) James Iha, who was getting off the A train at Hoyt Schermerhorn and looked pretty lost. 8) Paul Giamatti, too many times to list. I have nothing to report on him, as he gives off a “don’t talk to me vibe,” which he is probably 100% right to do. 9) The original Becky from Roseanne. That chick used to be out and about all the time. One night, we made drunken plans once to go to Niagara Falls together in the morning because she’d never been. For the record, that trip never materialized. I’ve never run into famous Brooklyn Heights resident Bjork, and not for lack of persistent trying. I’ve also never run into Nora Jones, Alexis Bledel, or Michael Pitt. My friend saw M.I.A. at the snooty French bakery on Smith Street, but I wasn’t around that day. I also used to see Michelle Williams all the time before she moved to Red Hook, but it seems weird to include her in the list because it was so long ago. 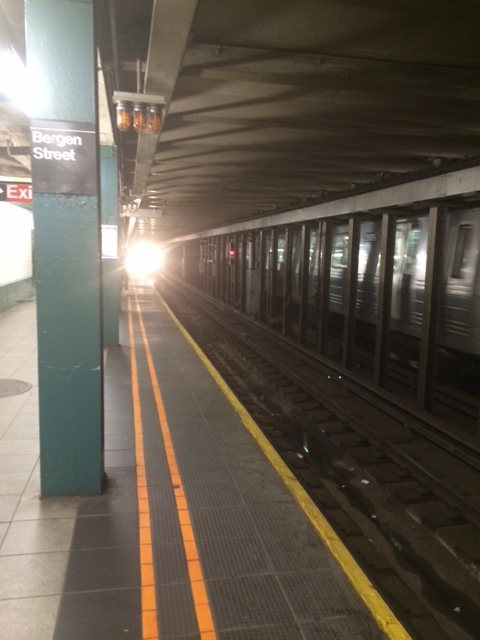 Living in New York City is full of many perils (crime, vermin, subway derailments, etc). Life here also offers a great many annoyances, most of which are related to the fact that there are far too many people living here, crammed into buildings that are rapidly falling into rack and ruin. Even the most pleasant of neighbors can become a most hated enemy in a matter of hours if a leaky faucet, raucous party, lonely dog, or toothing toddler are involved. 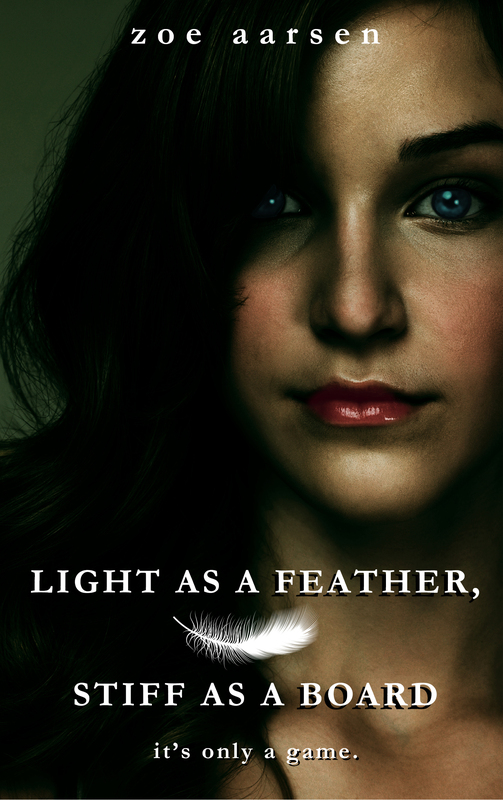 My paranormal romance for teens, Light as a Feather, Stiff as a Board, was published just about a year ago, and to switch things up, we changed the cover last week. I think readers approve, because it’s suddenly #1 on the Amazon free teen paranormal romance and horror lists. Exciting! Here are a few things that I’ve noticed from readers’ comments that I never would have guessed as a novice YA writer. Use them to either avoid pitfalls, or capitalize on what I’ve learned! 1) if the prose of your book contains the words “one” and “direction,” whether you were intentionally trying to reference the boy band or not, female readers will find those two words together and freak out instantly. 2) if you develop a cute, emo teen boy love interest, threatening his life or killing him off will provoke a greater reaction from your readers than anything else that might happen in your story, including having your heroine die, commit terrible sins, or experience dire hardship (John Greene co-signs this point, with Augustus as evidence). 3) teen girls actually really like feisty, strong-willed female characters. In writing this book, I didn’t think too much about the sharp-witted, pint-sized character Mischa, but because she’s the most outspoken character in the book, she’s by far the readers’ favorite. There’s an abundance of wishy-washy female characters in YA, and this generation of teen readers doesn’t identify with them. 4) Female readers will discover and invent references to pop culture influences in their own lives whether you want them to or not. There’s no need to load your book up with mentions of Austin Mahone, the Beebs, Harry Styles, or whatever style sneakers kids happen to be wearing today. Mahone fans will find context in your work even if you try to avoid it. How can you possibly memorize every single lyric? You can’t. You don’t have to, your readers have already done it. Last night I had a terrible dream about Oculus, that super scary movie about a haunted mirror. I haven’t even seen this movie. I don’t even have the balls to watch the whole trailer when I’m home alone and yet it’s already messing with my head. When I woke up this morning I realized that a project I’ve been working on for little kid readers about magical realism actually makes much more sense as a really scary story targeted at grown-ups. There’s a very, very fine line separating magic from horror. I actually find the topic of old-timey magicians during the age of vaudeville to be kind of terrifying. Most of the famous guys, Houdini’s competitors, were grifters and tricksters in addition to illusionists, like the super shady Alexander C. who was rumored to have married over 14 ladies, some of them at the same time (wasn’t life grand before computers prevented us from breaking laws)? These fathers of conjuring and optical tricks have always fascinated me, and their legacy lives on today in our fascination with reality TV mediums. I spent this past weekend in Chicago visiting my family before the big rush of holiday airport traffic, which gives me severe agita. My family is blessed to have my three-year-old nephew Declan, the most charming rascal you’ll ever meet, with a glint the size of Texas in his eye. “Thanks,” is how he replies when he’s told that he’s cute. “I know,” is how he replies when he’s told that he’s funny. The reason why this line in a children’s book makes me stop cold has little to do with the Grinch, himself. On the morning of September 11, 2001, I was standing at the corner of 29th and Fifth Avenue, surrounded by co-workers. I’d gotten up late for work that day and was not only annoyed with myself, but annoyed with whatever craziness was going on in the city as I trudged, head down, toward my office near the Empire State Building. In 20o1 I didn’t own a cell phone yet, and hadn’t bothered turning on my television set that morning in my haste to get to work. I heard sirens and saw people rushing around, some standing on corners, pointing and gawking, but I had no idea that the World Trade Center had been attacked. After a summer of consistent tenement fires in my neighborhood and construction accidents across the city, I just assumed that the usual urban nonsense was to blame. I didn’t have the slightest clue what was happening until my walk from the East Village brought me to the top of Madison Square Park, where the National Guard had cut off access to anyone trying to go further north on Fifth Avenue. Several of my co-workers, banished from our office building, were lingering there, not sure whether to walk home or stick around. Cabs had pulled over on both sides of the street, and cabbies leaned out of the open doors of their vehicles blasting news radio. It was then that I finally turned downtown and saw smoke billowing from the towers. My co-workers informed me of what had happened, or at least what little they had been able to piece together. A plane had hit. No one knew what was going on. Everyone was making sarcastic assumptions about how dang long it would take to fix the building, how subway service would be messed up. It hadn’t occurred to any of us that there had been casualties. And then, much to the horror of the thousands of people who’d been ambling around at the little intersection where we’d been collecting, the first tower fell as we helplessly watched. Three months after that horrible day (three months that were filled, in New York, with the inescapable stench of burning jet fuel, tattered photographs of the lost taped to buildings by loved ones, and in my own personal case, a dangerous case of strep throat that had resulted in a brief stay at the hospital), I was really not in the Christmas spirit. I was daily waffling through a full range of emotions, as I think a lot of city dwellers were that year. On a walk past the holiday windows at Lord & Taylor, my attention was caught by robotic models in a diorama spinning to the tune of “Have Yourself a Merry Little Christmas,” and I burst into such a violent torrent of misery for families that had lost someone in the tragedy that I gave up on my errand (I’d been on my way to buy tickets to see Cynthia Nixon in The Women on Broadway) and walked home for the afternoon to sit alone in the dark. Despite the fact that no one in the city was feeling festive, the holiday arrived. Despite all that had happened, it came just the same. And that year, Christmas gave us a reason to be especially thankful for our lives, our safety, our families, our jobs. As a city, in the months between September and December, we had pulled together. We had witnessed something unspeakably awful in each other’s company. We had hugged strangers in the street. We had shed tears over people we’d never met. We’d donated blood for survivors who never arrived in emergency rooms. We shook the hands of the men and women in the National Guard who arrived in tanks to protect our neighborhoods, who gave us a sense of security that we desperately needed even if the actual danger had passed. Paul’s card had been an emphatic reminder that even though we weren’t ready for Christmas, there was no avoiding it. It was time to start healing. Even now, twelve years later, the simple line of that children’s book for me carries with it a profundity that surpasses a statement on materialism. Christmas comes once a year as a gentle reminder to look around, be grateful for our lives, and to take the time to enjoy them. 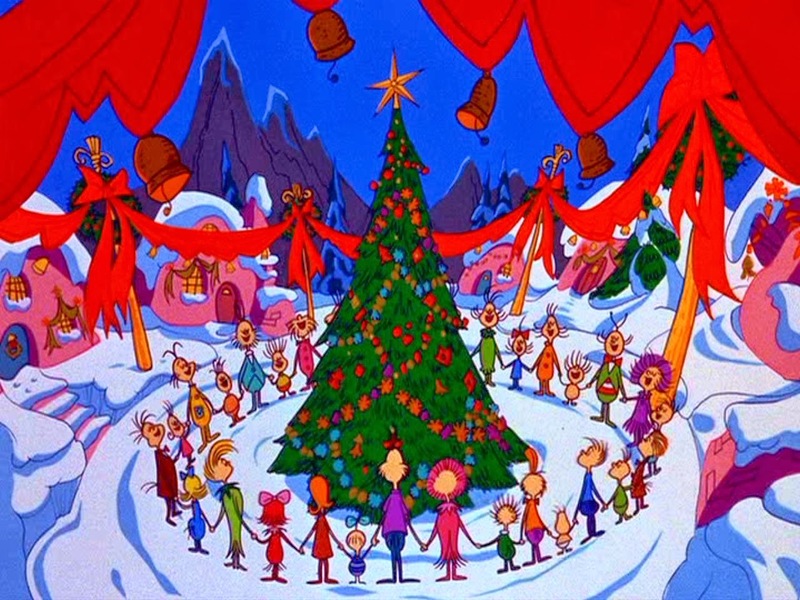 I may never again read all the way through The Grinch without my throat closing up, and I’m not sure that I’d ever want to, because Christmas for me is a time of peaceful remembrance. If you have a three-year-old in your life this holiday season, spend half an hour with him or her and read a book together. The time you spend with him or her is worth far more than any gift you could buy.